Stefan Decker: "Semantic Web and Semantic Web services: Can One Go without the Other?" 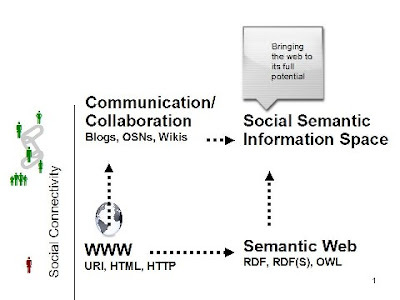 "Semantic Web and Semantic Web services: Can One Go without the Other?" I just accepted an inivitation for a panel at the 3rd International Conference on Service Oriented Computing (ICSOC), Amsterdam, The Netherlands, December 12-15, 2005. The titel of the panel is "Semantic Web and Semantic Web services: Can One Go without the Other?". The other panelists are Amit Sheth, John Domingue, Frank Leymann, and Martin Hepp. As a Semantic Web scientist this is an irresistible opportunity to get grilled within the European context, which is very heavily invested in Semantic Web services. Without a doubt Semantic Web Services have their application area, but in the first place the Web is a communication and collaboration medium between humans - and this potential has not been fully exploited so far. This slide describes the idea and the path forward looking at the social semantic side of the Web.